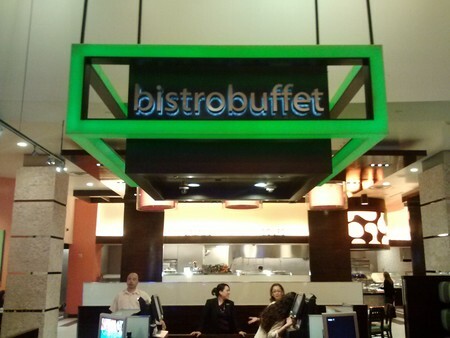 Just a hop, skip, and a jump away from the Las Vegas Strip is the Bistro Buffet. Located within the Palms Casino and Hotel, this all you-can-eat, one stop shop offers cuisine from all four corners of the globe in a sleek and trendy setting. Dining at the Bistro Buffet is easy with breakfast, lunch, and dinner available Monday through Saturday, as well as a Champagne brunch and dinner on Sunday. 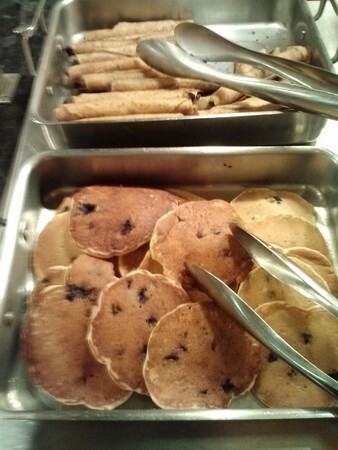 Breakfast costs runs from 8:00 a.m. until 10:00 a.m. and features a “Build Your Own” Omelet bar. 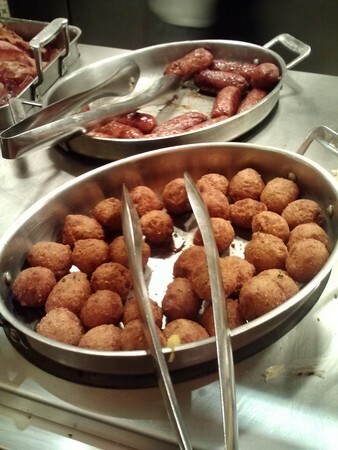 Lunch runs from 11:00 a.m. to 3:00 p.m. with a variety of hearty buffet favorites. Dinner is nightly from 4:00 p.m. until 9:00 p.m. During dinner, guests can feast on specialties like crab legs and an elaborate dessert bar. End the weekend with some bubbly during the Champagne brunch, which includes unlimited Champagne with the price of admission. Brunch is served Sunday only, from 8:00 a.m. to 3:00 p.m. and corrals the crowds of hungry patrons every week. If the food is not enough of a draw you in, Club Palms members receive a discount on valid buffet entries. The Bistro Buffet is the perfect excuse to step away from the bustling Las Vegas Strip for a meal full of fun and feasting at the Palms Hotel. Breakfast at the Bistro Buffet inside the Palms is a solid all-you-can eat establishment filled with plenty of favorites for a cheap price, but the distance from the strip can be a bit of a downfall. The Palms Hotel and Casino Resort is located on Flamingo road, a little ways from the Las Vegas strip. This causes a slight inconvenience for people staying on the strip. 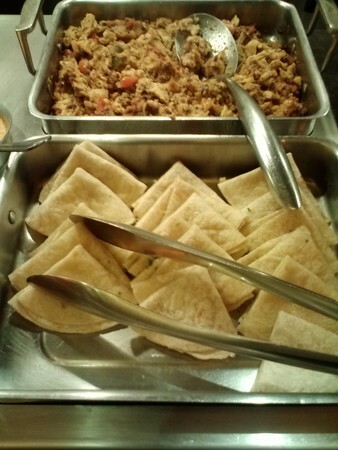 Open for breakfast, Sunday brunch, lunch and dinner, the Bistro Buffet offers selections from multiple cultures around the world, such as a spread of steamed and cold crab legs, roast beef from the craving station and Lebanese-style chicken during dinner hours. But today I am here to enjoy breakfast. 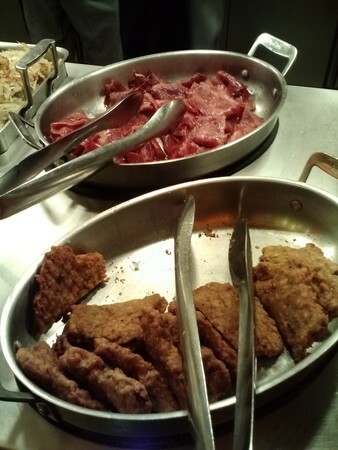 The buffet’s price is easy on the wallet when compared to some of the others on the strip. Breakfast is $8.99, lunch is $12.99, and dinner is only $25.99. In addition, Sunday brunch, which includes unlimited Champagne, is offered for the price of $19.99. As an added bonus, Club Palm members receive a discount of up to $7.00 on their entry into Bistro Buffet depending on the time. Just $12.99 for Sunday brunch after the discount with all-you-can-drink Champagne is a ridiculous price for any buffet in Las Vegas, and a steal for club diners looking for a deal. 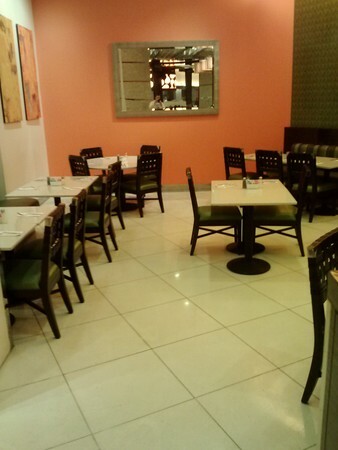 The Bistro’s décor is powerful, and its color palette is energetic. 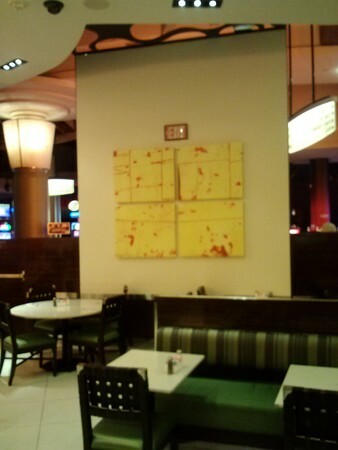 Near the cash register, a large portrait of a woman, right before she bites into a luscious red apple, adorns the wall. A Geometric pattern resembling animal spots garnishes the walls and ceiling. 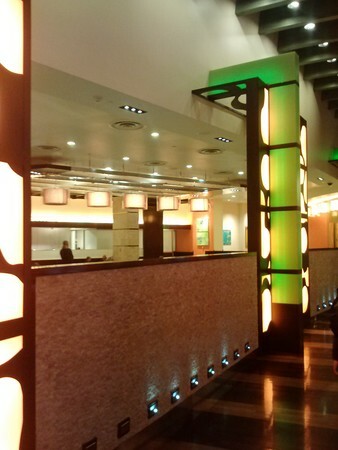 The design of the buffet mimics the style of the Palms Hotel: flashy, eye catching and enticing. 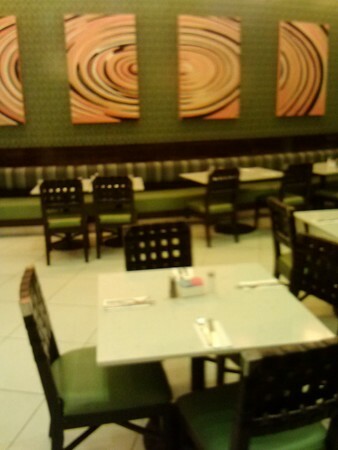 However, the dining room does a complete 180 degrees in style and color. The room’s design feels basic and minimalistic, and the décor seems somewhat Asian inspired. White marble is used for the floor and tables, and the room’s pillars have an oatmeal-colored complexion, while the ceiling lights resemble a contemporary take on Asian lanterns. All of the tables are equipped with woven chairs. Our server quickly takes notice of us and asks what we would like to drink. The selections cover the basic breakfast beverage options: soda, juice, coffee, and teas. Alcohol, like Champagne, domestic beer and wine, is also available for guests that want to start their morning with a bang. All-you-can-drink alcohol is included in the price for dinner. Diners have the option to order as much domestic beer, wine and Champagne as their heart’s desire during dinner without increasing the price tag, which is an enticing accommodation other buffets don’t provide. She dashes away to retrieve our order, soon returning with drinks in hand, and we start off our buffet on the right foot. The dining room is a long strip packed with many tables and chairs. During the weekend, especially during the Sunday Champagne brunch, I can see this place getting filled with people encroaching on each other’s personal space. My guest and I make it for breakfast on a weekday, so the attendance count is low this morning. But, it is easy to imagine the Bistro Buffet getting busy, and diners bumping elbows due to poor table arrangement. 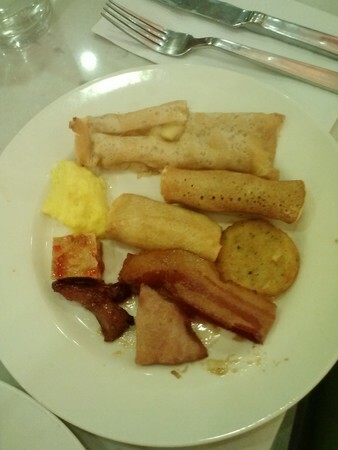 I walk the breakfast spread before I grab my first plate of food. 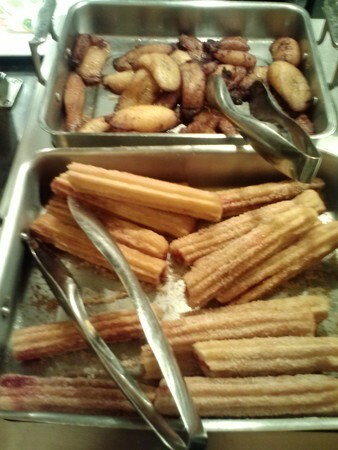 While I look, I grab myself a fresh Mexican churro from the International section to warm up my stomach and palate. The churro is sweet and crispy, and a great amuse bouche, in my opinion. 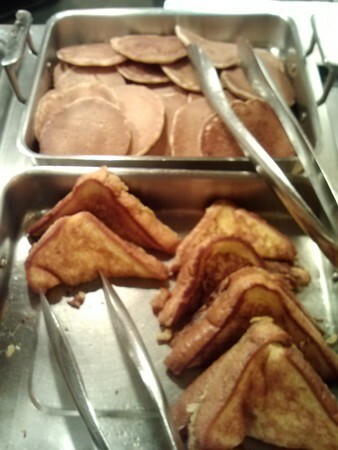 The breakfast selection at the Bistro features the typical favorites: bacon, eggs, waffles, pancakes, and sausage. 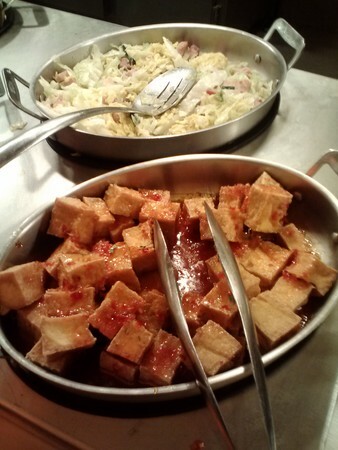 Asian dishes are also featured such as fried egg rolls and vegetable chow mien. I pass on the Asian excursion. From the looks of the elastic layer developing on top of what appears to be Asian style beef stew, I believe many other diners pass on it, too. 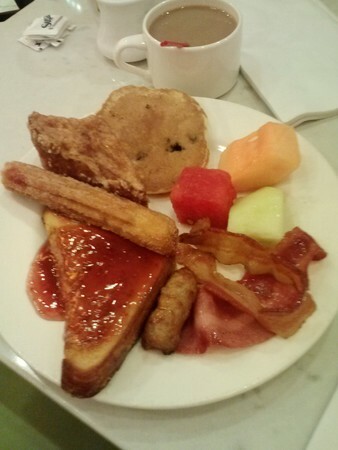 My first plate is mixed with items that are most intriguing: a bacon bagel breakfast sandwich, sausage English muffin sandwich, chicken apple sausage and bacon (okay, I know bacon isn’t anything special, but it looked good.) 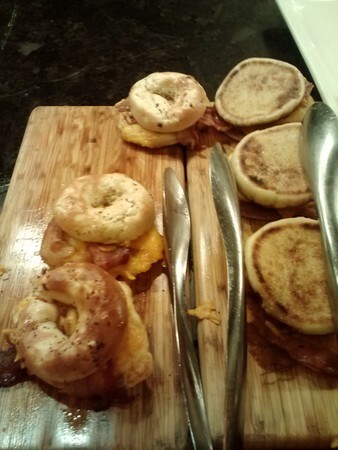 The breakfast sandwiches are individually handcrafted, which is an amazing idea for a buffet. Each is equipped with a fried egg and cheese. 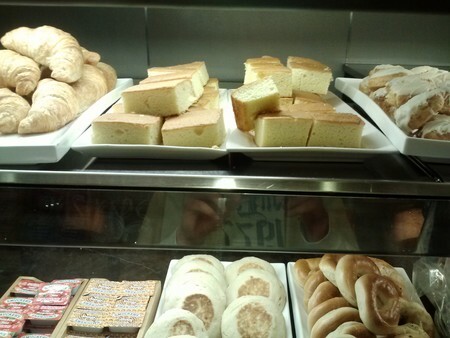 It makes me feel like the buffet wants to produce the best breakfast variety they possibly can, and the sandwiches are a great change from choices at other places. The chicken sausage is a nice change in pace, too. 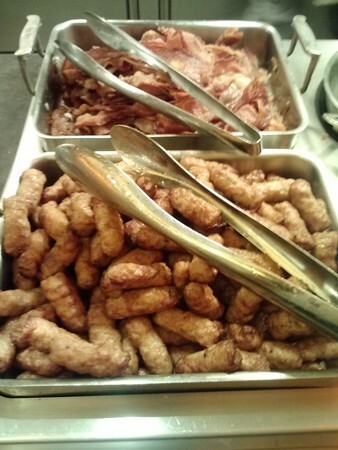 I’ve seen far too many pork sausages on the menu, and it’s great that the Bistro Buffet switches up the selection and offers favorite breakfast options with different proteins. The bacon is crispy and fatty, just the way it should be, and I am sure it will make another appearance on my up coming plates. Next, I move towards the section that really caught my eye when I browsed the Bistro’s selection: the create-your-own eggs & omelet stand. 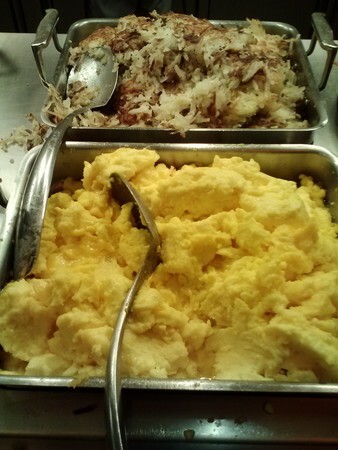 The Bistro Buffet offer patrons handcrafted egg & omelet choices made by a talented onsite chef. 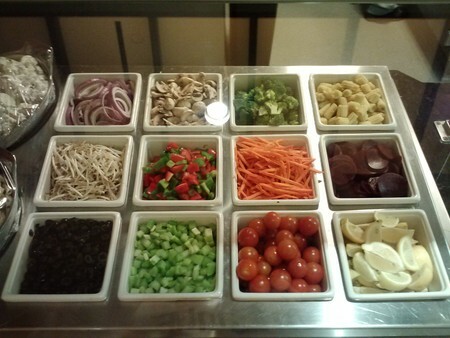 I am able to choose from a plethora of toppings including bacon, sausage, onions, scallions, tomatoes, spinach, jalapenos, cheddar cheese, mozzarella cheese, mushrooms, green peppers, sliced olives and red peppers. I choose to create a gigantic omelet with all of the toppings except for peppers and olives. The chef nods at my request, adds all the ingredients and begins to showcase her talent on the stove in front me and other guests. She juggles between three other egg creations with ease. She flips my omelet like the chef’s on television, even though it probably weighs around the same as a 12oz New York strip. The chef puts on a spectacular show filled with multitasking and culinary talent and finishes my egg monstrosity with no sweat. I walk back to my table with my omelet creation a happy man. The service here is superb. Our waiter is very attentive and refills my three beverage choices, coffee, water and orange juice, immediately upon request. 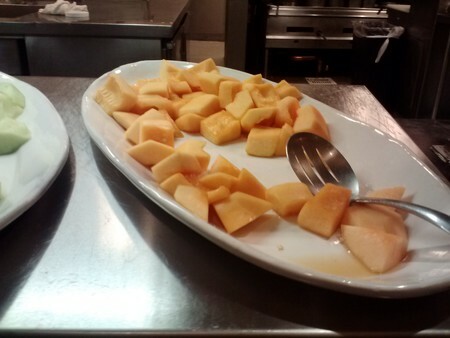 In addition, my previous plate is cleared, making room for me to enjoy my omelet and my beverages in comfort. 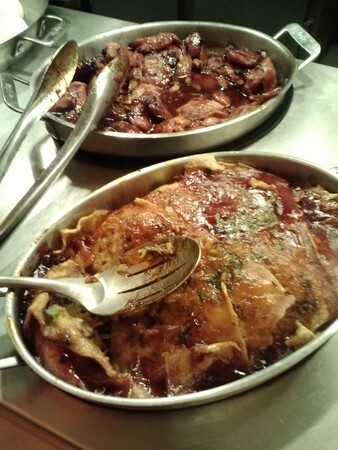 The omelet is heavy and flavorful from all of the diverse ingredients. 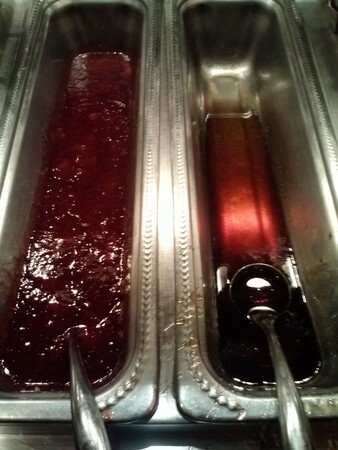 However, it’s a bit greasy. 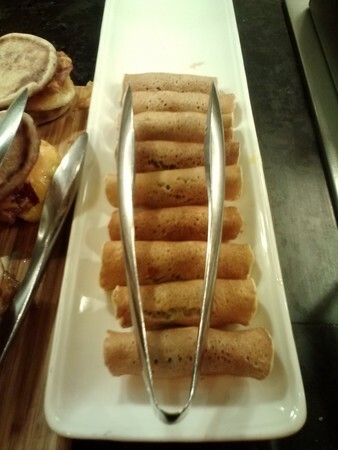 Nonetheless, the dish is satisfying and it is definitely the shining highlight of the breakfast buffet. 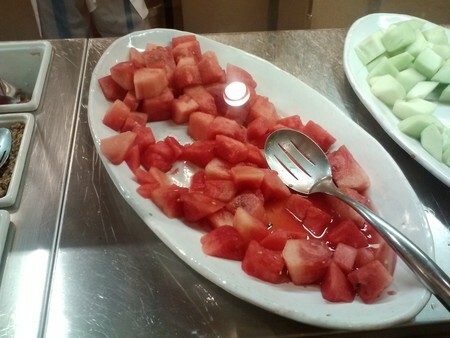 Aside from the more traditional breakfast options, the buffet offers an arrangement of healthy choices. 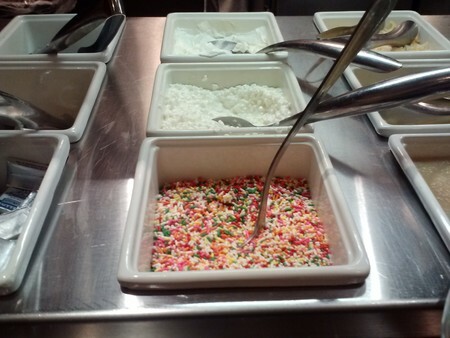 There is an assortment of fresh fruits, oatmeal, grits and cream of wheat with an array of toppings, as well as egg whites for those watching their cholesterol levels. 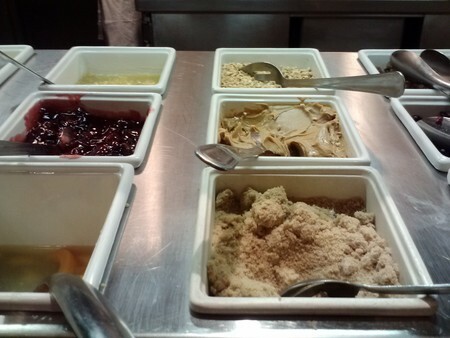 The Bistro also boasts a wide selection of yogurt options with toppings like dried fruits, nuts and brown sugar. 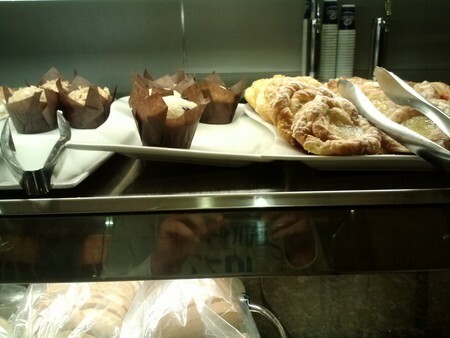 The healthy choices look enticing, but I decide to keep my next plate less healthy with more sweet and savory breakfast selections: pigs in a blanket, a potato pancake and an apple crepe. 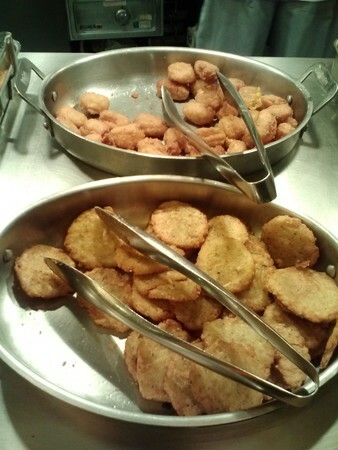 The potato pancake is crispy and its texture is similar to hash browns, while the apple crepe is very sweet, delicate, and delicious. The apple crepe is the best way to end the meal because dessert is all but non-existent during breakfast, with little more than a soft-serve ice cream machine. 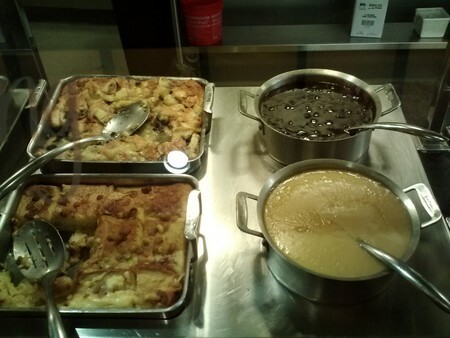 However, the buffet does feature a vast selection of desserts for lunch and dinner, which the chefs are setting up now as we leave. 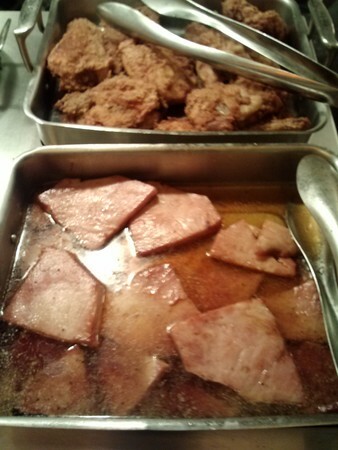 The Bistro buffet at the Palms Hotel Resort is certainly a solid pick. The price is a steal, and if I were staying at the Palms, I would definitely make it for the Sunday Champagne brunch and the seafood dinner featuring all-you-can drink domestic beers, wine and Champagne. However, its distance from the strip might make me think twice about dining at the Bistro Buffet, no matter how much I can drink on the house. The quality of the coffee is above average, which I appreciate, and the juice is fresh. It took only a few minutes from arrival to seating, and the line never gets extremely long on weekday mornings, but it is evident from the amount of space dedicated to the line that the weekend brunch and dinner hours are a different story, so prepare for a bit of a wait. The location is easy to find by following the signs from the parking structure to the casino and on to the buffet, and the walk is about ten minutes if you hustle. Though it is off the strip, the Bistro Buffet offers a fairly good value; for those staying at the Palms or the Rio, it is a no brainer. Corkage Fee: No outside alcohol. | Breakfast 8 a.m. - 10 a.m.
| Brunch 8 a.m. - 3 p.m.